BB-10, now as a depression is currently at 10N and 84E, with a core pressure of 1002 mb. As the system is just South of the favourable ridge (mentioned earlier), it will track West, and due to adjacent wind shear at 20 knts, it will deepen more, and develop a stronger wind force in the Northern semi circle. This semi circle will have winds upto 30 knts, and Chennai will get gusty NE winds of the same speed from Sunday night itself. BB-10 will move into central coastal TN around Monday night, with centre at Nagapattinum/Karaikal. Heavy falls in Puddukotai and Thanjavur districts. But, rainfall will be increasing throughout the TN regions from Sunday evening, with heavier falls in the Northern coastal regions. After crossing land, the system weakens. AS-2 , is now located as a low at 6.5N and 72E, with core pressure at 1006 mb. I personally make it that this system faces multiple problems in its life time ! System faces stiff resistance from O-3, which is moving Eastwards, will not allow it to track Northwards, but force an Easterly track. On the other hand, being located far too Southwards, a superb feeding in the Southern semi circle from Southerly winds at 30 knts, will strengthen the Southern quadrant with thick clouding. Problems for the poor guy !! I feel, it will be forced to track NW for sometime, and strengthen upto mid Arabian Sea location, and then dissipate in the sea. From Monday, as BB-10 moves inland. See vagaries Chart map for easy reference. 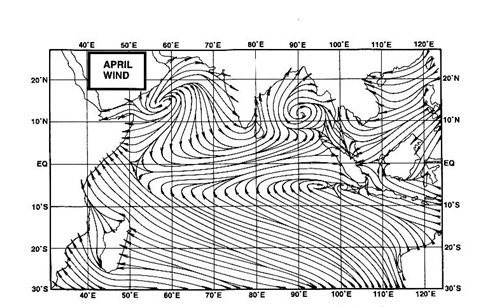 We, see as a result, Easterly winds along South-East coast of India, to the Mah regions, and South-Westerly wind from AS-2 over the Western side. This creates a line of dis-continuity in the Peninsula and initiates clouding and an unstable atmosphere. Chennai: Increasing rains from Sunday. Rainfall will be around 30-35 mms on Monday (till Tuesday 8.30 am) with gusty NE winds. Rainfall upto 40 mms continues into Tuesday as well. Decreasing amounts from Wednesday. Good Showers for Bangalore from Tuesday into Wednesday. Mumbai: Dry weather till end of October. But temperatures will be on the higher side till end of this month. (and even after in first week). Nice explanation Sir. I also not seeing anything in AS- 2 intensification till 31st Oct ! So given mine view expressed in previous post comment section. But 1st week of November remains confusing in terms of Konkan area at moment . So picture will be clear in next 2 days ! Till then Peninsula region benefited due to Bay low. different charts show, AS-2 moving towards mumbai with mumbai and neighbouring areas possibly getting a major chunk of rain on 1st 2nd and 3rd of november ... rajesh....what say..??? me too feel the same that mumbai will experience dry weather till end of october , but from 1st november mumbai will experience wet weather.possibly(THUNDERSTORMS )infact entire konkan coast will have the same weather, including Goa.infact even surat might experience wet weather on 2nd november. well as abhijit said we will wait until tommorow evening things will be much clearer. paulodon:situation are 60/40 at the moment but as i said , tommorow will make things look more clearer, to conclude whats instored for mumbai n entire konkan belt,well i feel the pressure around mumbai is likely to fall n the winds are going to turn S-SW,and so this will favour wet weather in konkan coast including mumbai. North becoming cooler day by day with meerut 10.6c,hindon 10.7c and gurgaon 11.7c. Now I see some interesting happening ! AS- 2 remaining stationery till 31st Oct at 700kms WSW of Trivandrum at 7 N latitude & 70 E longitude then moving NNW from 1st Nov. In all this process Bay low or depression hitting near Cuddalore of TN coast by Monday night then breaking in to two parts ! 1st part moving inland from Cuddalore and 2nd part moving north of Chennai that is hitting near Ongole AP coast. All this around 31st Oct. And from 1st Nov Bay low moving NW may touch Goa also ! So Konkan and Madhya Maharashtra may get thunderstorm on 1st Nov. So if Maharashtra getting any rain on 1st Nov then it will due to Bay low only due to its NW movement ! And in all this process AS -2 till 1st of Nov in form of depression still remain over deep Arabian Sea west of Kerala coast at 700kms from coast only ! Mumbai radar gone down(under test) guys . So cannot see which area are having drizzles or rain ! 50 KMS south of Tirunelveli.heavy thundershowers 6pm.Intense precipitation.40mm in just 25mts.ENE movt,Lightning SE of Cape 10 pm. Paulodon: sure we can expect some rains around Mumbai around 1st/2nd, but due to line of wind discontinuity caused by AS-2, as explained ..
Jeremiah reports of heavy rains. Reports also come in of heavy rains from Nagapattinum (our predicted lanfall site) and hailstorms in Cuddalore.. But rajesh sir is it ,that chances are high for AS-2 to fizzle out in the arabian sea, at the moment it looks like it will develop n travel north. Last night Neral and surroundings had windy rains. At that time Badlapur was just windy with cloud cover. Beautiful day in bangalore. Its hazy and windy. 93W over the bay should start affecting weather in bangalore from tomorrow evening. Hope the system crossed around cuddalore and moves in a north west direction towards dharmapuri.